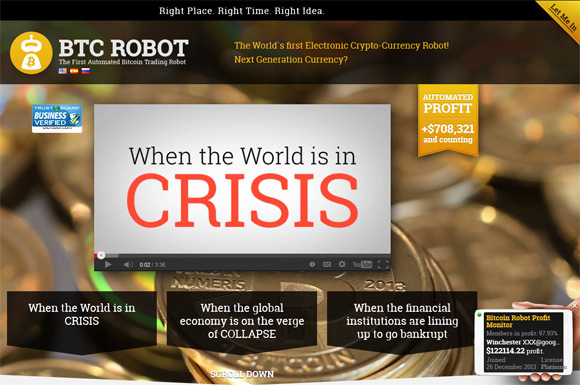 If you have been following our reviews of automated trading solutions for crypto currency trading, they you’ve probably seen our review of the BTC Robot automated Bitcoin trading robot. One of the things we have noted in our review is that the trading strategy utilized in the robot has relied on data form MtGox and that is not anymore possible with the current situation with MtGox. However the authors of the software have already announced that they have implemented a change in the software, so that it will still be fully functional and making profit from automated trading on the BTC-E crypto exchange (the only exchange supported). Apparently Mtgox has been replaced by Bitstamp some time ago in BTC Robot trading algorithms, so the issues with MtGox should not affect the robot in any way. As we have already reported in our review, we are recommending to go for the plans where you get the robot cloud hosted and not in a downloadable form as we’ve had some trouble with it. Also note that our review of the product coincided with the start of the trouble that MtGox had before completely closing down, so our trading experience with the automated trading robot was not too positive. But if you are interested in trying it out, then you may do so now that it no longer relies on MtGox data. We have also tested the 60 day money back guarantee and it works, though it may take 2-3 days for you to get your payment back if you are not happy with the software. This kind of works as a kind of trial mode for the BTC Robot automated Bitcoin trading robot, so you can try it for a bit and if you are not happy with the software or the results to get your money back. Another thing that we still haven’t tried is a version of the automated trading software for trading Litecoin called LTC Robot that you can also get either as bonus with the BTC trading software or for a little extra on top for what you pat for the Bitcoin trading product. We have been testing the BTC Robot automated Bitcoin trading robot for a few days and we went for the Silver plan that gives you a downloadable version of the software to use on your own computer. We have already described some of the issues we’ve went through using that version as you can only install it on one computer and not move it to another later on (unless you contact the support and request you want to do that). We have also had some trouble making the automated trading software work properly on Windows, even though it should be supported. As a result we would recommend to go for the higher plans that will give you a cloud based version of the trading bot that you can access and use from different computers and that will be online all the time, so yo don’t have to keep your computer online 24/7 like you need to with the Silver Plan and the downloadable version. Furthermore, due to the fact that the BTC Robot trading algorithm relies on data coming from MtGox and that exchange has been having some trouble lately and things are really crazy with the exchange rate there for the moment the market situation is preventing the bot from executing trades properly. That is precisely why we have decided to test another advertised feature of the software – 60 days money back guarantee. We have requested a full refund and now, 2 days later we have just received our payment back. We have used BTC to pay for the Silver Plan and we got BTC back in our account, though the amount is a bit less than what we have sent as apparently the payment processor takes into account the exchange rate at the time of payment and refund. The refund took about 2 days to process and us having back the money in our BTC wallet after making our full refund request as per the 60 day money back guarantee. So that works pretty good as well and it gives you the ability to test the BTC Robot automated Bitcoin trading robot for a few days and if you are not happy you can get your money back. Kind of works like a trial version, so you can test the software and if you are not happy with it to get your money back. Three days have passed already since we have started testing out the BTC Robot automated Bitcoin trading robot, so it is time to report how things are progressing so far. Nothing much has happened since we’ve started using the software for automated trading, though we suspect that the reason for that is the current BTC market situation and the way that the trading bot operates. The fact that MtGox and Bitstamp – two of the largest BTC exchanges are currently not allowing Bitcoin withdraws due to possible vulnerability in the BTC transactions has created some chaos on the market and the exchange rate is going mostly down as a result. 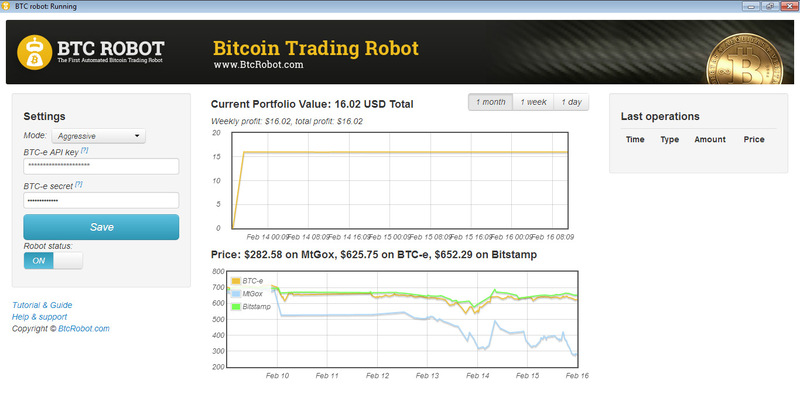 Even though the BTC Robot actually trades on the BTC-e exchange that has not suspended any of its operations regarding BTC withdraws or deposits and the BTC/USD exchange rate is fluctuating the robot is not executing trades on it. Even considering the fact that we’ve set the Aggressive trading option that should be more active on executing trades with a bit higher risk, but also with supposedly higher profit on success there are no trades because of the weird situation on the market. Hopefully things will get better soon and the trade bot will be able to trade properly soon, or the authors will implement a different trading strategy that will be effective even at the current market situation. What you cannot normally learn before you purchase the BTC Robot automated Bitcoin trading robot is the trading strategy it relies on. Normally these automated trading solutions rely on some sort of market indicators such as EMA to “know” when to buy and sell to generate you profit. This solution however relies on a slightly different market indicator, it compares the current price at MtGox and compares it to the exchange rate at BTC-e to decide if it should buy or sell. The software uses three different indicators to make its decisions and they have different values for each of the preset modes you can choose from – Conservative, Medium and Aggressive mode or use your own custom settings. Below you can find the default trading settings for the three modes and in the Custom mode you can change them as you wish in order to get better results – less risk and profitability or higher risk and profitability. One more important thing to note, especially if you are getting the Silver Plane where you get the BTC Robot as a downloadable software to install on your own computer as we did, instead of a version of the bot preinstalled in the cloud. You can only install the trading software on one computer as it does not checks, so do not install it on a laptop at work for example just to test it first – go directly to a dedicated computer that can be online 24/7 at your home. We have contacted the support to see if we can move the software to another computer as now we have to keep online a laptop that we installed it for a quick test running and on all the time, so this is just a bit of inconvenience, though the support helped us resolve the issue and the software has been moved on another system. Going for a cloud-based service with the other two plans will probably be much easier and problem free solution, so you better consider these.